I've been interested to play with PostgreSQL for a while and it looks like now is the right time to have fun and go mad at it since my new work requires it. I've encountered a few hiccups when trying to connect the pgAdmin to the PostgreSQL server and here are the steps to avoid that in the future. drwxr-xr-x 2 postgres postgres  4096 Jul 29 00:34 .
drwxr-xr-x 3 postgres postgres  4096 Jul 28 23:50 ..
Insert a line to pg_hba.conf file to grant client access to the database. In short, the above lines will do the following: grant client, via network connection TCP/IP with or without SSL (host), access to all (first) database for all (second) users from the IP addresses of 192.168.0.0 to 192.168.0.255 and use md5 password encryption. The psql command must be run as postgres user (hence the sudo -u postgres) because that is the only user that has an account in the default installation of PostgreSQL. 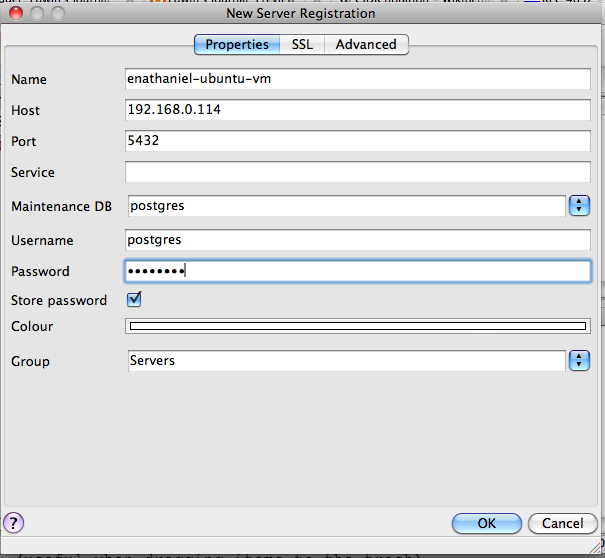 The following screenshot should give some idea how to connect to the PostgreSQL instance. PS: Yes, there's no food, fruits, or traveling story in this post. This week will be my last week before I go back to the grind, so we decided to have fun whenever we can. Here are our destinations on the first day of our "Summer Freedom Week!" We have not been to Granville Island for a while. Our main target here was to have our lunch at "Go Fish". Unfortunately it wasn't meant to be since they have to go fishing on Monday. So instead of feeling sad and depressed, we took a few pictures since the weather was awesome. Must be nice to have a waterfront view apartments, wondering how much a unit may cost your wallet. Since we were hungry, we decided to leave Granville Island. Instead of going straight to the parking lot, we went through a few stores for a quick window shopping. We may have buy these stickers soon. Sometimes Vancouverites amazed us, there are plenty of them enjoying their Monday as if money grows on their backyard. We can only guess what they do for a living. Woofles & Meowz? The Z comes from the 90's? Kidding aside, too bad we don't have pets. Came across one shop that we have no idea what it sells because we couldn't find the entrance door nor we can see the inside. Who knows eh..? Boss sleeps throughout the day, leaving us to enjoy to the fullest! We went to SalaThai for our lunch because of the proximity and also ever since one of our favorite Thai restaurants near our home has closed due to a new apartment complex is about to be built there, we haven't had Thai. Wife ordered Beef Phanaeng Curry that comes with this unknown bowl of soup (a bit sour and slightly spicy). The Lard Na was a bit unusual because typically Lard Na isn't that soupy. But it tastes good, so who am I to judge? The calamari was a late order because my stomach was not quite there yet and the Boss demanded his lunch as well: MILK PLEASE! Lucky we're prepared. Overall the lunch was quite nice and the price was reasonable. Came across one of those "hip" food truck. The last time I tried a food from a truck, it was okay but overpriced. Some of my friends have had similar experience. Speaking of food truck, have you ever watched the Eat St. TV show airing at the Food Network? VPL was our last destination before heading for home. We had a few books of our interest that we wanted to borrow. That's it for our Summer Freedom Week day one adventure. Day two is coming up tomorrow!